How Far is Sai Nikita Niki's Brundavanam V? The moment you step in to Bibi Nagar, you are Transported to a different realm. The 200 acre fenced and guarded communited oozes comfort. Wide smooth roads, flawless concrete, pockets of shrubs, greenery against pristine blue canvas makes you feel a privileged resident. Lifetime Club Membership in out Resorts. Sai Nikita Estates Private Limited, a pioneer in the real estate industry, creating living spaces for people with good infrastructures. Sai Nikita Estates Private Limited develops projects to give a better home to the residents. The Company has started construction under the name of SR Constructions. Sai Nikita Niki's Brundavanam VI is an example of amazing work done by the company to provide the best living experience to the customer. 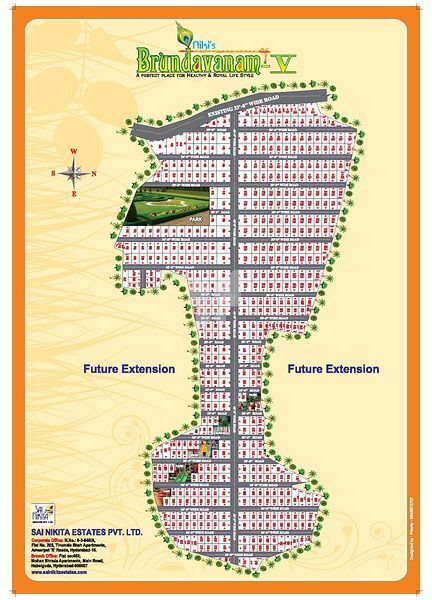 The project is located in Bhongir. Sai Nikita Estates Private Limited is committed to delivering best to the customers. Sai Nikita Estates Private Limited has involved its self in providing apartments, independent houses in different parts of the city. Delivering the best quality homes which are constructed at the strategic location built with quality materials and has a good amount of amenities too. Initially, the projects are situated in Guntur and Vijayawada and then shifted to Hyderabad during 2006 to start developing landmarks, some of the projects are Nikita Homes, Sai Nikita Brundavanam III, Sai Nikita Nikis Brundavanam II, Sai Nikita Niki's Brundavanam V, Sai Nikita Gardens and the list goes on.